We were delighted to welcome John Fleck of Whitley Bay, who was the winner of our caption competition. 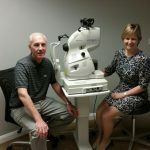 John is pictured having his 3D OCT scan with optometrist Judith Robinson. “It was a nice surprise to win” comments John. 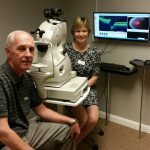 “I was already a customer of Robinson Optometrists as I have always been impressed with the level of service and technology”. We would like to thank John for his kind comments and again thank all those who took part in the competition. Previous Previous post: Celebrating British design. Next Next post: Fantastic News! Robinson Patient scoops Top National Prize!